One of my sons enjoying Swedish summer. Now that I am beginning to have a somewhat sizable collection of trip reports and trail guides that are mostly located in the nation I call home, I figured I ought to have an article dedicated to how it's like to hike and camp in Sweden along with some helpful tips and such. I feel lucky to live here for many reasons, but one very important reason is that for an avid nature lover and backpacker, it has several aspects that make it one of the best places for outdoor life in the world. In addition to the huge amount of gorgeous wilderness to explore, clean water, plenty of trail shelters, abundance of marked trails, kind people, and good train system, perhaps the biggest factor in what makes Sweden such an amazing place to go and be out in nature are its "Everyman's Rights" or Allemansrätten in Swedish. These are laws and regulations that allow anyone to travel freely in nature as long as they obey certain rules and are respectful of nature. For instance, private land owners cannot put up fences or otherwise restrict people from traveling through the wilderness, and anyone is allowed to camp out in the wild anywhere unless by special exception (nature preserves and the like). Notice that I use the word "wilderness" here, and this obviously does not apply to people's private backyards, so don't go and pitch your tent on grandma's flowerbed. You can also have campfires so long as you are responsible and follow some basic rules, unless there is a a fire ban due to dry conditions. Fire bans from my experience are rare, mostly during summertime, and happen after roughly a week or two without any rain. People are free to swim in most natural bodies of water, pick berries and mushrooms, and ride bikes or horses on most trails. There is a lot more information and lots more details in the link above, and it is simply a must read for anyone that plans on doing any backpacking or camping in Sweden. However I will give my own two cents on some things that I hope will be helpful, in no particular order--just off the top of my head, and I can update and revise this post as needed in the future as well. There are many bodies of water in Sweden. Even if you were stranded in the middle of nowhere and were not close to any source of water, it would probably rain on you in not too long anyhow. So aside from it being a good idea to bring rain gear with you, also don't worry about hauling too much water with you as you hike. I take between 1-2 liters maximum--most of the time it's only two 750ml bottles (one in each side pocket of my pack). Everywhere I have hiked through in Swedish nature I never had to worry about re-filling my water supply. Lakes--this is perhaps the most common water source--streams, springs, pools of rainwater, and then there are taps that you bump into also. All tap water in Sweden is safe to drink, and usually tastes great too (but not always). There are times I don't bother to purify my drinking water, such as small, cold, clear springs that are literally flowing out of the side of a hill or mountain with no farms or houses for many kilometers. National parks and nature reserves are generally a safer bet when it comes to good, clean water. Filling up a buddy's bottle on a group trip a few years ago. However just to play it safe, I will filter my water with my Sawyer Squeeze or boil it about 75% of the time in the forests and about 50% up in the fjälls--and this is mostly out of paranoia if you ask me. I have talked to a significant number of backpackers and locals that don't treat any of their drinking water out in nature here, and have never heard of anyone getting sick from bad water. But of course this is just anecdotal, though I thought worth mentioning--in the end drink at your own risk. The risk here seems to be pretty low, though. 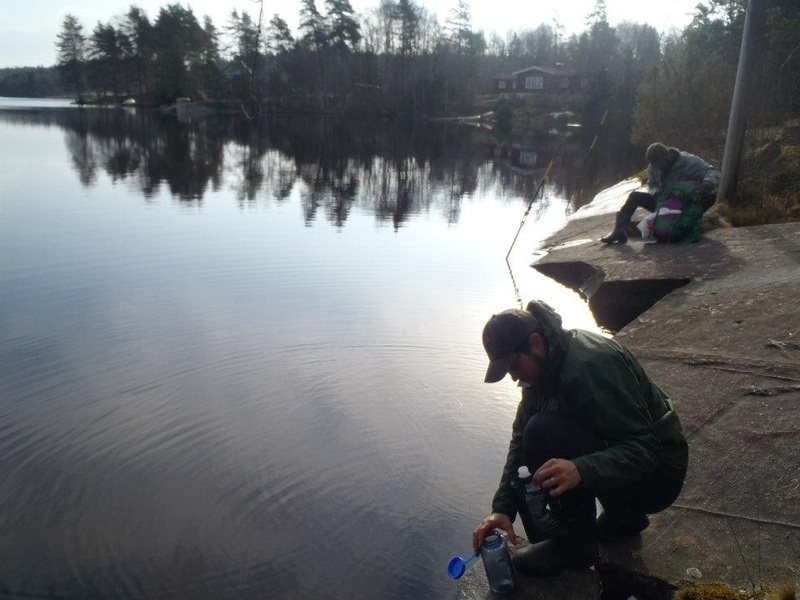 I have lived in Sweden for over a decade as of now, and have consistently drank a fair amount of raw water out in nature. I have also consistently swam in many different bodies of water. I have never gotten sick or an infection due to the water here. Another issue with having so much water around and it raining/snowing a lot is that you are going to get wet. Just face it, accept it, and deal with it. Especially your feet and legs, they will be wet probably quite often. My solution is to wear shoes that can easily dry out rather than water proof shoes, and I keep my feet warm when needed with good quality socks made of wool or synthetic material that keep you warm, even if they are wet. If you have "waterproof" shoes, they will eventually get wet too, if not from the outside, then from the inside with your own sweat. But it's up to you how you deal with wet feet--just know that this will be a nearly constant issue here. As I said before the train system is a good one here. In bigger cities like Stockholm, Göteborg, and Malmö there are also buses, trams, subway, ferries, etc. In the big city the public transit can be hit or miss, so I won't comment much on that part of getting around; but the trains around the country are quite reliable most of the time, and are clean and generally pleasant and modern, but are generally expensive. Once you take a train out of the city, the rural/backcountry buses from my experiences have been not bad. They don't run very often, but considering some of the isolated places I have caught a bus or train from, I can't complain too much here. Make sure to plan your transportation well in advance, and check to make sure things are the same right before you go. Some bus/train stops and local areas and landmarks have long Swedish names and it helps to write them down along with your times and plans. This helps too when you can't pronounce things properly and you can just show your notes to people so they understand where you are going. You can use Google Maps' public transit button when getting directions, which I have found quite helpful and generally quite accurate. Depending on where you are going in Sweden, there are different websites of different companies that you can use to plan and buy tickets and such. Make sure to take advantage of student discounts if you can, and on some trains there are plugs for you to charge your phone or use a laptop or tablet, plus free wi-fi. In the Västra Götaland county (and also the city/area of Kungsbacka, which is technically in Halland county), which includes many different hiking trails like Bohusleden and several E1 trails, the company that runs most of the public transportation is Västtrafik. On most trains you can pay on the train with a bank card for a ticket, but it is usually somewhat more expensive than if you buy a ticket in advance. Big cities will have cards you can buy with passes/tickets loaded on them, or alternatively you can load money onto these cards to pay for tickets, just keep in mind that these cards don't work on all trains or in other big cities. Make sure to ask about where your card/ticket is valid and for how long when you buy it, and when in doubt, ask locals for shortcuts or more effective routes and such if possible. Google Maps or even the official train website will never be as good as a helpful commuter that knows all the tweaks on how to get around in their area. I will of course be using broad strokes here, so please any Swedish people reading this, don't get offended--I am not suggesting all Swedes are like this! Right off I will say that Sweden was a far more cosmopolitan and diverse than I thought before moving over here. There are many immigrants from all over the world, and in big cities you will hear many different languages being spoken. Most Swedes speak English, and of the ones that do, most of them speak it quite well. It's pretty much immigrants and the elderly that don't speak English as much, and even then a fair amount of each group does. But of course ask people if they speak English (or whatever language you want to try and use) first. I have heard a lot of Swedes complain about certain types of tourists that just walk right up and start speaking English at them. It can be abrupt and confusing, so try and be respectful about speaking English to Swedes, and you will find they will speak much better English to you as well. Most of my Swedish friends speak just as good or better English than a lot of native speakers. As you ought to expect, more people speak English and with better fluency in big cities than woodsy villages. A lot of Swedish people of all ages really do enjoy nature, so you'll bump into them often on trails. Yet I have found that most of them are day hikers, but avid day hikers mind you. They are mostly kind people, but can be a bit reserved or perhaps "shy" to some more loud and extroverted cultures perhaps. A lot of typical Swedes don't really chit-chat with strangers, but the ones that do--especially the more "underground" type people (e.g. Punk, hipster, artsy, etc.) --more often than not go against the grain and are very chatty and open. Don't take offense if in a supermarket someone bumps into you and says nothing, for instance. Or if on the trail people give you a quick nod as they pass you and move on and that's that. For a hearty meal, nearly all towns and neighborhoods have a kebab/pizza shop, and surprisingly every now and then really good Thai food due to a sizable amount of Thai immigrants. There are also working class type cafés and shacks (Swedish: gatukök or kiosk) that have meat and potato type Swedish food known as Husmanskost. It's fairly easy to be a vegetarian/vegan in Sweden, and most places have alternatives or will make a veggie option. Some examples are: in kebab/pizza shops go for a pizza or falafel roll and fries (no cheese pizza or falafel roll no sauce or tomato sauce if vegan), in Thai shops the pad Thai with tofu (ask for no egg, if vegan), and at a gatukök ask for a soy sausage with your mashed potatoes (ask for a vegan protein on bread if vegan, these places are not as vegan friendly). Trail food is easy to find in supermarkets, and there are plenty of supermarkets around (even in most villages), but you probably won't find any dehydrated backpacker meal-in-a-bags. You can pick those up at camping specialty stores like Naturkompaniet or XXL, but they are pretty expensive. Swedes are big fans of sandwiches, so you can either buy ready-made ones or plenty of ingredients to make your own. Then of course there are the staple backpacker foods too--don't worry, they have ramen noodles here too. Check the "world food" section of the market for noodles, couscous, tortillas, and other such foods. Plenty of chips, nuts, chocolate, and candy to be found in all markets as well. Be careful with some candy and check the label, as Swedes like to eat some rather unique/odd combinations of candy, such as salty licorice (which can look like sugary gum drops). Some supermarkets have fish mongers outside of them where you can also try the local seafood, such as ready-made shrimp sandwiches (usually comes with slices of egg, tomato, cucumber, and mayonnaise), which is one of my favorites. The most trail friendly food at these places is the smoked or cured fish, which is usually mackerel or salmon. Nearly all of salmon is now farmed rather than wild caught, unfortunately, if you care about that sort of thing like I do. You can of course just do quick Google searches for either a PDF to print out or a map/book to order for the trail/area you are going to be backpacking in. However if you are going to be spending some time in a big city before you hit the trail--and I strongly suggest you do, Stockholm and Göteborg (I am not very familiar with Malmö, but hear good things) are both really cool places to hang out in with a lot of culture and fun things to do--you can stop buy a big book store like Akademibokhandeln and buy really nice Swedish maps. I buy a lot of maps made by Lantmäteriet, and recently they have started to use water resistant paper with a Pretex coating, which makes my life easier not having to water proof maps on my own. I have found these maps to also be extremely accurate the grand majority of the time, easy to read/use, and the keys have English translations. As of now they cost around 140 SEK for the Terrängkartan (green colored, nature/backpacker friendly) selections of maps. There are also Tyvek maps available by other companies, but not for all regions/trails. There are also some free maps available from tourist offices and centers in big cities, but these are mostly related to city life--though still helpful to have when traveling through here. You can also check out Lantmäteriet's map database here, where you can create maps to print out. So if you have a lamination machine and time, you can print your own waterproof maps for very cheap (and free to download). The most common fuel here for cook kits is by far alcohol, which is mostly known as rödsprit in Swedish. Rödsprit is denatured alcohol that has a red dye, but you can also find a clear version of denatured alcohol (teknisk sprit in Swedish) that burns cleaner, though it is not as common and slightly more expensive. The grand majority of gas stations, camp ground stores, outdoor gear shops (e.g. Naturkompaniet, XXL, etc. ), hardware stores (e.g. Clas Ohlson, Jula, etc. ), and camping sections at larger supermarkets (e.g. Coop, ICA Maxi, etc.) have 1 liter bottles of alcohol fuel for sale. Gas containers for gas stoves are also fairly common, but not quite as much as alcohol. Check the same places that you would find alcohol listed above, but just know that gas cans might not be as available. Esbit is the most difficult camping fuel to find here. I have only seen it for sale at Clas Ohlson (this is where I buy it, and they only have the 20 packs of 4g smaller tabs) and Naturkompaniet. So long as there is not a fire ban due to dry conditions, or you are in a specific area where fires are prohibited (which is rare), you are good to go if you have a wood stove in your cook kit or if you prefer to cook over campfires. There are plenty of sticks and branches laying around the woods for you to use, but keep in mind what I mentioned earlier about it being rather wet here. Sweden in general is a pretty safe place. There are not that many dangerous animals, and crime is relatively low. Wild animals attacking people is very rare, as is violent crime--and even among both of these rare and unfortunate cases, getting seriously hurt or killed is even more rare. So in general, don't worry, but obviously take sensible precautions. It's a good idea to keep your food in a sealed and waterproof bag, and to hang this bag high up on say a tall tree branch. This discourages the much-feared animals (even if this fear is irrational) such as bears and boars from eating your food, invading your campsite, and potentially attacking you. And yes, there are bears and boars here, but odds are you probably won't see them--plus nearly all bears are in central and northern Sweden. In reality, hanging your food is mostly to keep more common and merely annoying animals away, like mice and large birds (e.g. crows, magpies, seagulls, etc. ), and if you are closer to civilization, dogs, cats, and rats. The animals you should worry about pretty much boil down to ticks and snakes, and so long as you are careful, dealing with either is not that big a deal. One could say that moose and boar could pose a threat, but we're once again discussing what would be a very rare occurrence. Moose and boar are generally shy and won't bother you, and if you see them they will most likely run away. If they don't, just yell and make yourself look big (e.g. open your jacket up and puff out your chest) and they will most likely run away. Perhaps the most probable danger with moose is if you encounter a female moose with her baby moose, in which case just stay as far away as possible, and back away slowly. I encountered a moose mother and her calf on a few occasions, and each time the mother threatened to charge me, but backed off after I simply moved away slowly and carefully. But back to the more probably threats. The first step is to inform yourself about ticks and snakes and what to do if you get bitten by either. Google and Wikipedia are your friends. Picture of a snake (not sure what kind) I took near a shelter on Bohusleden (Stage 15). Picture from Wikipedia of a Huggorm. Getting a snake bite is more dramatic and immediate threat, but there is only one venomous snake in Sweden (the Vipera berus or Huggorm in Swedish); and while a bite from them will be painful, they are rarely deadly. I have almost stepped on these snakes a few times, but because I am careful while I am hiking through places they are more likely to be, I was able to move out of the way. I have seen plenty of Huggorm in or around the woods here, however. According to one source--Mallow D, Ludwig D, Nilson G. (2003). True Vipers: Natural History and Toxinology of Old World Vipers)--there are about 1,300 Huggorm bites a year, with only 12% of them requiring a visit to the hospital. The next step is to simply avoid them and/or limit potential contact with ticks or snakes. Try not to tread through places that ticks and snakes are more likely to be, and if you have to, be careful and watch your step. It's a good idea to poke around with a staff or trekking pole while hiking through tall grass, for instance. And after hiking through tall grass and brush, check your shoes/socks/pants for newly acquired ticks. Snakes also like to sun themselves, especially on stones and on top of piles of sticks/grass, as they are cold blooded. Ticks, while not really an immediate threat, still pose some very real dangers due to the diseases they spread (e.g. Lyme, TBE, etc.). Odds are you will most likely get a tick or two if you spend enough time backpacking here (especially in the summer), so it's a good idea to not only carry a pair of tweezers to remove them and know how to properly remove them, but also to look into vaccines against TBE--one of the more serious diseases ticks carry. Check yourself often for ticks during tick season, especially the high season in the summer. It is very important to remove ticks as soon as possible to reduce your risk of getting an infection/disease, and make sure to do it properly. Here is a brief but helpful guide from the Center for Disease Control of the USA for more info. *Update 07/03/2015: Regarding rural dogs. I didn't think I would have to include a note about dogs here, but during a section hike I did last week I had a rural dog try and attack me yet again. This marks the 3rd time I have been attacked by a rural dog out on the trail, so this is enough of a pattern/issue now that I felt the need to include something about it here. I grew up with dogs and am familiar with their behavior and how to treat them, I should add, and in the end was not bitten in any of these three attacks. With each of these three dogs that tried to bite me, the story was nearly identical. I walked by a farm in a rural area, and there was a dog that was off a leash and not confined by a fence. It aggressively barked and charged me, poised to bite me when it got close to me, and even tried to bite at my feet/legs. Twice I had a trekking pole with me, which was useful to keep the dog away, but one time I didn't have a trekking pole and really had to be careful. So be mindful of loose farm dogs out there, and know what to do. In general, it's good to know the difference between a curious dog and a dog that is about to bite you. You don't want to put your hand out for a sniff to an angry dog, or you are likely to get bitten. What I did each time to prevent getting bitten was to try and stay still and hold my ground at first, to show the dog that I am not afraid of it and that I am not prey. Then I slowly backed away out of the dog's territory (the farm) carefully watching the dog, ready to defend myself if I need to. When the dog snaps at me, I evade the bite (put the trekking pole in front of the dog's face or just side-step away) but continued to hold fast on my own personal space and carefully back away. Two of the three times these dogs came at me, a farmer eventually came out and took the dog away. One time however (and this was the time I didn't have my trekking pole!) no one came to get the dog! I had to be extremely cautious and focused to get myself out of that situation without getting bitten. Don't act like prey, and just get out of the dog's territory as carefully as you can. You can read more about what to do when a dog attacks here. As far as general dangers go that can happen anywhere, like you fall and break your leg or something, the emergency number is 112. It's of course always a good idea to have a charged mobile phone with you, as well as a good whistle, just in case. Well, that's everything I can think of for now as far as general tips and info goes. If you have a question or specific tip you'd like to see here, feel free to leave a comment below or send me an email.